Erected by Francis Patterson cooper in memory of his beloved wife. Margaret Tindel died at Pultneytown 15th April 1887 aged 57. 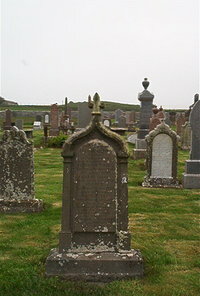 Son George died 1st July 1866 aged 4. Daughter Catherine died in infancy. Son John Patterson died at Montreal 4th March 1892 aged 28. Husband Francis Patterson died 13th December 1915 aged 89.